Protecting a Twitter account can seem like a fairly easy decision – particularly if you’ve had problems of one sort or another, and don’t want certain people bothering you or reporting on what you’ve said. But in most circumstances, protecting a Twitter account isn’t a good idea. Even though I’m a very strong advocate of online privacy, I firmly believe that for most users, protecting a Twitter account is futile, damaging, and ultimately pointless. There are some benefits, and I have used the protect function myself. But not for the reasons most people use it. It’s good for conducting experiments, running ‘hidden’ accounts for the purpose of reading Twitter anonymously, etc. But the notion that protection can be used on a fully active account to keep out the riff raff whilst maintaining the attention of the desirables, is a fallacy. The unseen masses are the people who read your Twitter without you knowing they’re there. There may be a heck of a lot of them, and they may easily outnumber your actual Twitter followers. They don’t follow you in the conventional way, but they’re reading, and paying attention. They may use Private Lists, Search Bookmarks/Widgets, or third party sites to keep up to speed with your updates, or read you in passing by exploring conversations on other people’s pages. But none of these people can continue to read your Tweets once you protect your account. And if you depend on Twitter for business, or Web traffic, or any other type of publicity, you could experience a progressive drain in uptake after you protect. You don’t necessarily lose official followers, but you do lose an untold number of readers. So if you use Twitter for any kind of promotional or publicity purpose, you shouldn’t consider your followers to be your only audience. Protecting your account could even cut out the majority of your readers, and that’s a huge sacrifice to make just to avoid the eyes of one or two individuals you don’t like. If you say anything that actually matters, retweets are your best route to growing your audience in a meaningful way. 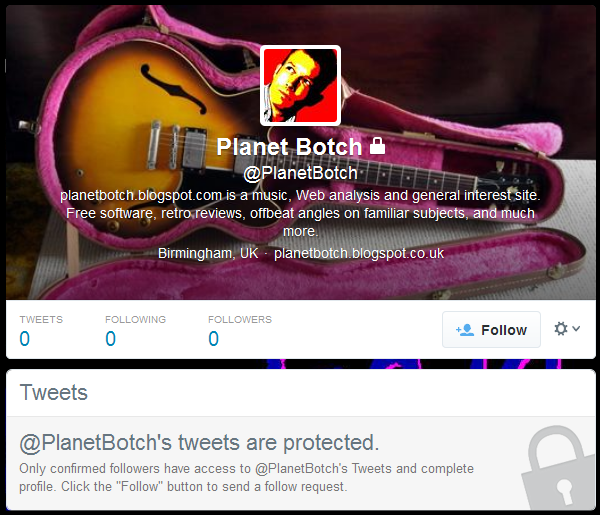 Protect your account, and you prevent people from retweeting you to a new audience. If people know your name and would ideally like to follow you on Twitter, the likelihood is that they’ll go onto Google, and type: “[Your Name] Twitter” into the search box. But if you’ve protected your account, Google will not consider you a priority, and even though your profile will probably be indexed, it’s unlikely to come up at or near the top of the search results. No protected Tweets can be crawled by the search engines, so any old messages, which might have been referring new followers from the search engines to your Twitter page, will drop out of the search results, and you’ll lose another source of new followers. You should also know that typically, once Google has cast you aside, getting back into the visible results is far from instant. It’s not just a case of reopening the account and being back on Google within 24 hours. You could be waiting for weeks. Facing facts, a protected Twitter account is not in any way welcoming to newcomers. I’ve never actually made a follow request to a protected account, and I don’t see myself doing so in the future. There’s also the point that many people want to see what you’re like before they’ll follow you. If they can’t get a picture of your behaviour on Twitter, they just won’t follow you. Twitter is awash with rogue accounts, fake accounts, spam accounts, offensive accounts, automated accounts, scam accounts… The worst of these often take the step of protecting in order to conceal their behaviour from all but their target users. Ultimately, if no one can see what’s happening inside your account, how do they know what they’re letting themselves in for? On one of my sites I have a page which compiles lots of interesting Twitter feeds into a single timeline. It’s good for me in the sense that the page gets repeat visits from non-Twitter users who just want a convenient way to collectively view current tweets from the accounts I’ve compiled. And it’s good for the account holders, because they get the benefit of non-Twitter users (people who may not otherwise read them) seeing their updates. However, it’s not good for me in the sense that I need to keep an eye on the page to ensure all the accounts remain open, active, and importantly, public. That takes time, and often work. So neither I nor anyone else who compiles Twitter feeds for easy reading on a third party site is going to put up with users who can’t make up their minds whether or not they want their accounts to be public. As a rule, if someone on the page protects their account, I take them out of the feed, and I won’t put them back in – even if they unprotect in future. Everyone wants an easy life. If you’re making people’s lives difficult with erratic or unreliable behaviour, which includes temporarily protecting a Twitter account, you’ll lose their assistance, and you probably won’t ever get it back. So, you want or need to tweet someone, but they’re not following you. What do you do?… Well, there’s not much you can do other than unprotect your account, then tweet them asking for a follow, and leave your account unprotected until you get a response. Of course, if this is only likely to happen once, it may not be too great an issue. But if you regularly find yourself wanting or needing to message people who don’t follow you, protecting your account will be untenable. It’s so simple for someone who wants to know what you’re up to, to monitor all your incoming messages (using Advanced Twitter Search). I’ve covered this in depth in my Protected Twitter: I Read You Loud and Clear article, but suffice it to say that you really can’t keep anything a secret on Twitter, whatever the status of your account.